The variety of funeral hearts and cushions which Ellon Flowers can provide can cater to many tastes. Our dedicated team of florists in Ellon craft funeral flowers with attention and detail, so that we can provide high quality funeral hearts and cushions. Our flower delivery service aims to provide utmost satisfaction for our customers, and we recognise at such a difficult time your funeral flowers will be treated as with great care. Our Ellon florists have over 40 years of experience in the floristry industry, meaning that your funeral hearts and cushions will be made skilfully and carefully. The florists would also be delighted to help you with any advice you might need concerning your unique order. Flowers Ellon runs an excellent flower delivery service in and around Ellon. As we are part of the Interflora brand we can deliver to a huge range of locations across the United Kingdom, meaning that your funeral flowers can be delivered no matter the distance. We are also able to take international deliveries in 140 different countries, so just because you are ordering you funeral flowers in Ellon does not mean that they have to be delivered nearby. Ellon Flowers are also happy to provide a same day delivery service for all products ordered before 3pm, so that your funeral flowers can be with you as soon as possible. Our hardworking team is driven to provide the best flower delivery service possible in Ellon, which means that we oversee your order during every step of its journey until it is delivered safely. We recognise that ordering funeral flowers can be an emotionally difficult process, but we aim to make it as logistically easy as possible for you. There is no need to have any concerns when ordering your funeral flowers from Ellon Flowers, we can guarantee that you have made an excellent choice. Our wide range of funeral hearts and cushions are a great selection for you to choose from to add to your funeral flower collection. Here at Ellon Flowers we take great pride in our variety of funeral flowers which you can choose to add grace and elegance to the funeral proceedings. Our collection of flower hearts and cushions are skilfully crafted by our expert florists in Ellon. Simple elegance can be found in our classic white cushions and classic white pillows, composed of white chrysanthemums and a smaller selection of more colourful flowers. All of our flowers are fresh, meaning that our customers can be satisfied with the highest quality flowers for funerals. Our flower delivery service in Ellon can also deliver more unique creations, with contemporary cushions in vibrant and pink colours. Our selection of flower hearts are sure to bring a heartfelt touch to the funeral proceedings, with a number to choose from. 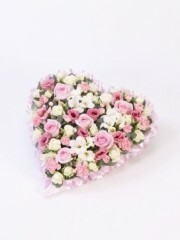 We offer open hearts, pastel hearts and red rose and carnation hearts to name but a few. These meaningful additions to your funeral flowers from the florists in Ellon will be a sign of true attention to detail at any funeral. Our more contemporary arrangements, such as our contemporary heart which includes roses, carnations and orchids are also a great option for those looking for something eye catching and unique. Ellon Flowers are determined to provide you with the perfect funeral flowers. Trust us to deliver you memorable hearts and cushions, as Flowers Ellon won’t let you down.